When artist Victoria Hanna McKinney decided to move in 2017, she made a wish list for the place she wanted to land. In February of this year, her list was fulfilled, landing her in Fergus Falls. Sounds like a great place to land…so what was on that list, you ask? 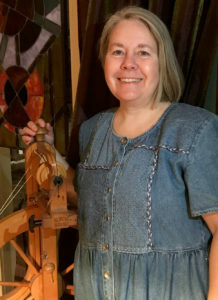 As a fiber artist, Victoria needed to find a work studio big enough to hold her looms. “Obviously, I have rather large pieces of equipment,” she smiles. Large studio to rent? Check. She had previously worked with Springboard for the Arts, the national non-profit that helps artists develop their business models. “When they came out here (to Fergus Falls), I thought something must be happening,” she said. “And when I started talking to people, I found a lot of interest in fiber arts, my preferred mode of expression.” Local artist support? Check. The decision to move to Fergus Falls hinged on what she would find there. What was the community like? “I started researching the community online. I went into community websites. I wanted a larger community, just not too big.” A “just-right” community? Check. “And I was looking for someplace that wasn’t too expensive to live,” she said. “Once I found the studio, everything fell into place. I’m living downtown, nearby, so I don’t have to drive to work.” Everything close by? Check. Victoria also finds lots of artist support networks. Fergus Falls is not only home to Springboard for the Arts, but also Lake Region Arts Council and Kaddatz Galleries. “I was looking for a community that was open to the arts, and had a lot of people who were interested in seeing, buying and learning about art.” A hometown market for artwork? Check. Now it’s time to add a wish to your own list. Stop by Torri’s Tangles to Treasures in downtown Fergus Falls and see some amazing local fiber art!